Roofers Choice II Synfelt is the synthetic roofing underlayment engineered for safety and value that makes no compromises in construction and performance. 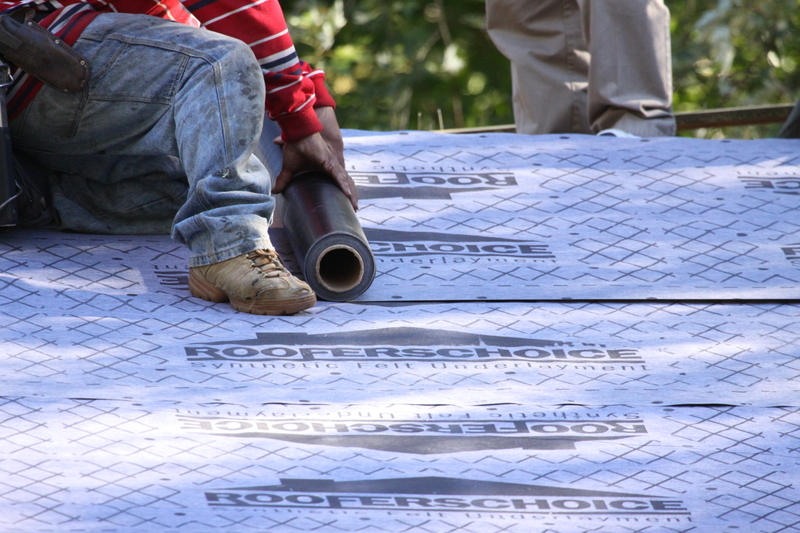 The best value in the synthetic roofing underlayment market, Roofers Choice II Synfelt synthetic roofing underlayment is conceived and engineered by industry experts who developed the safest and highest-performing products in the industry. Infused with the same principles that put a premium synthetic roofing underlayment on traction and handling, you get so much for the price – added safety, additional security and better performance. The Traction Ink Technology, weight and roll width of Roofers Choice II Synfelt synthetic roofing underlayment are features usually found only in premium synthetic roofing underlayment products. But Roofers Choice II Synfelt synthetic roofing underlayment offers their features at a fraction of the price of premium synthetic roofing underlayment products–nothing similar is available for the price. Roofers Choice II Synfelt synthetic roofing underlayment is the Made in the USA synthetic roofing underlayment. Roofers Choice II Synfelt synthetic roofing underlayment is a performance answer to the limitations of #15 and #30 paper roofing felt. Its polypropylene/polyethylene construction results in high strength, while maintaining low weight (approx. 38 lbs per roll), which makes it suitable for use under all roofing materials. Roofers Choice II Synfelt’s 60" width and 10 square roll size speed installation and minimize seams, so installation is faster, easier and more secure. Roofers Choice II Synfelt synthetic roofing underlayment is specifically engineered to address safety on the roof. Its top side utilizes our Traction Ink Technology, which is incorporated into our non-woven polypropylene surface. Roofers Choice II Synfelt’s deck-side surface is composed of an LDPE friction film that helps in stabilizing Roofers Choice Synfelt synthetic roofing underlayment during installation. Roofers Choice II Synfelt synthetic roofing underlayment combines our specifically engineered Traction Ink Technology with premium synthetic roofing underlayment qualities to provide a superior alternative to the other synthetic roofing underlayments and #30 roofing felt paper. With Roofers Choice II Synfelt synthetic roofing underlayment, you get added safety, better performance and additional piece of mind. This Made-in-the-USA synthetic roofing underlayment product provides the best overall value in the Synthetic Roofing Underlayment Market.